Sprinkles Go Gourmet: Taking Cake Decorating To The Next Level : The Salt Around the holidays, many bakers pay extra attention to how pretty their baked goods look. Their new secret weapon? 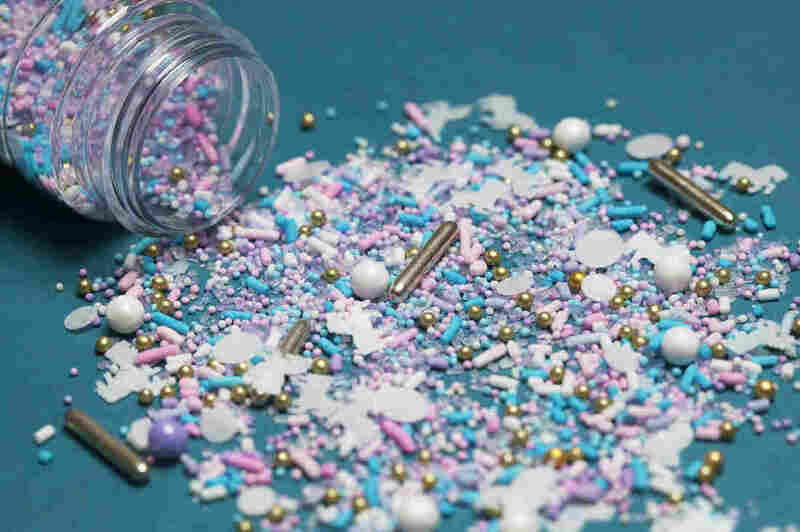 Gourmet sprinkles. 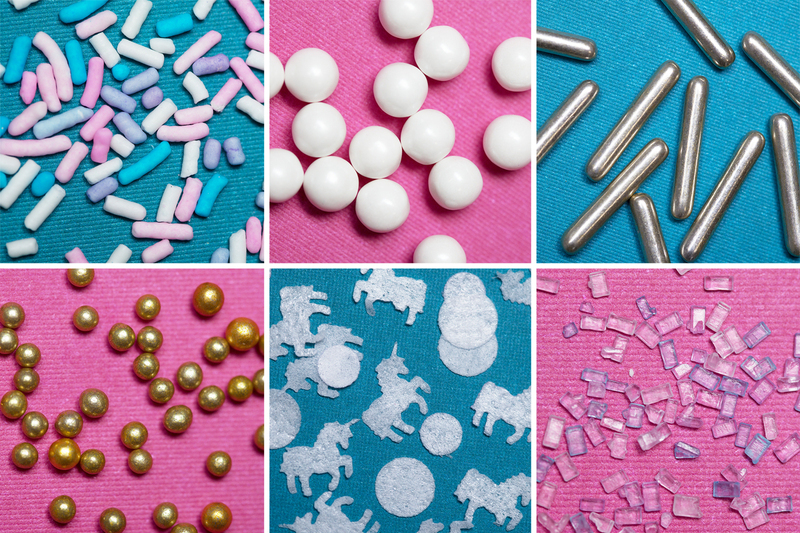 Sprinkle Pop's Unicorn Mix includes a variety of sprinkle textures and flavors. It's one of the company's most popular mixes. The Unicorn Mix includes, from the top left, standard sugar sprinkles, white sugar pearls, gold coated sugar rods, gold dragees, rice paper unicorn cutouts, and colored sugar crystals. "I went and bought the raw ingredients that I needed to do it myself and, even before I got the sprinkles home, it was like the idea was already in my head that I wanted to sell sprinkles," Butts says. This past March, she opened a gourmet sprinkle company called Sprinkle Pop. But before Butts opened her business, she sized up the competition. Wilton, one of the biggest baking supply companies in the world, makes standard sprinkles, but nothing like what Sprinkle Pop offers. "It was obvious to me that if I was going to do it, it was a great time to get in," she says. "But, you know, with anyone who's starting a new venture... you know the demand is there, but you're not quite sure how big the demand is." Butts says her biggest customer is a baking supply store in Australia, but the bulk of her orders come from cake decorators. 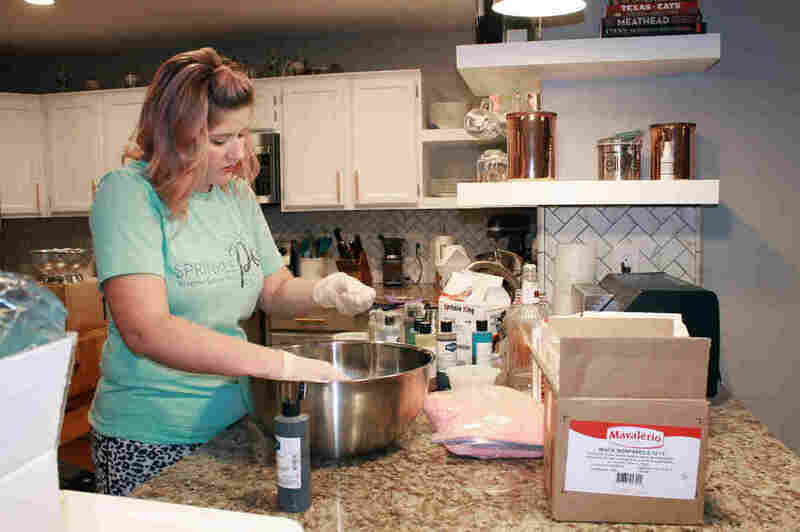 She currently competes in the sprinkle business with two other companies: Sweetapolita, based in Toronto, Canada, and Fancy Sprinkles in Los Angeles. "I'm number three and I'm going to be number one," Butts says. "No matter how many hours I have to put in, or if I have to not take a salary because I have to invest all the money back in the company to get what I need, then that's how it's going to have to go." Butts is determined to grow her business. It might help that the market for sprinkles is expanding beyond dessert. Take a look on Instagram or Pinterest and you'll find grilled cheese sandwiches with sprinkles cooked into the cheese, balls of cheesecake encrusted with sprinkles, and pancakes with sprinkles tossed into the batter. What's with the sprinkles on everything? "It just gives a little bit of extra sparkle and pizzazz that you sometimes can't get with just icing alone," says Amber Spiegel of Kingston, New York, who owns a cookie decorating company called Sweet Ambs Cookie Art. She makes intricately decorated cookies with sprinkles and icing. Spiegel has over a million followers on Instagram and almost 80 million views of her videos on YouTube. "The people that are eating them are just blown away... and they always say 'It's too pretty to eat,' but, you know, they taste good, so they eat them!" 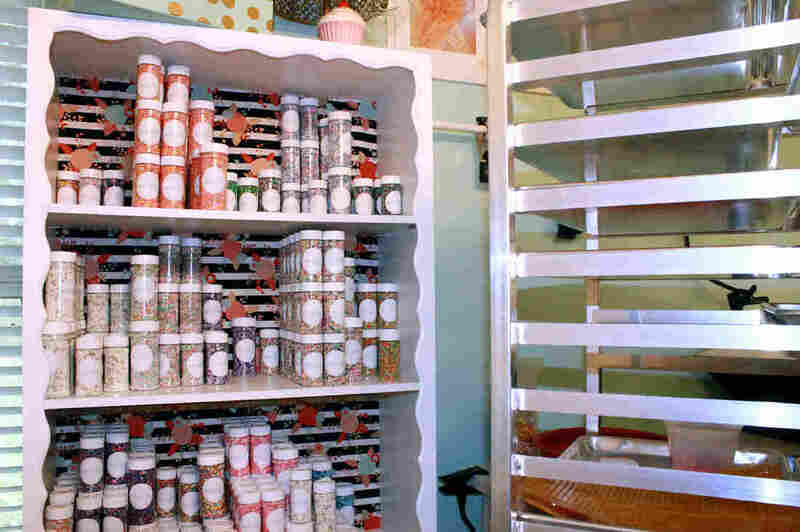 Spiegel relies on gourmet sprinkles for some of her designs. She says, as a baker, she's willing to spend money on fancy, gourmet sprinkles. It's not cheap, but it's a quick and easy way to make a cookie — or almost any other food — sparkle.